Curator Jack O’Brien has been with the Naples Art Association for more than a decade. On Feb. 28, he will receive Collier County’s highest award recognition for art leaders in our community. The Naples Art Association is very proud to announce that one of its long-time staff members has been honored with a very special designation. 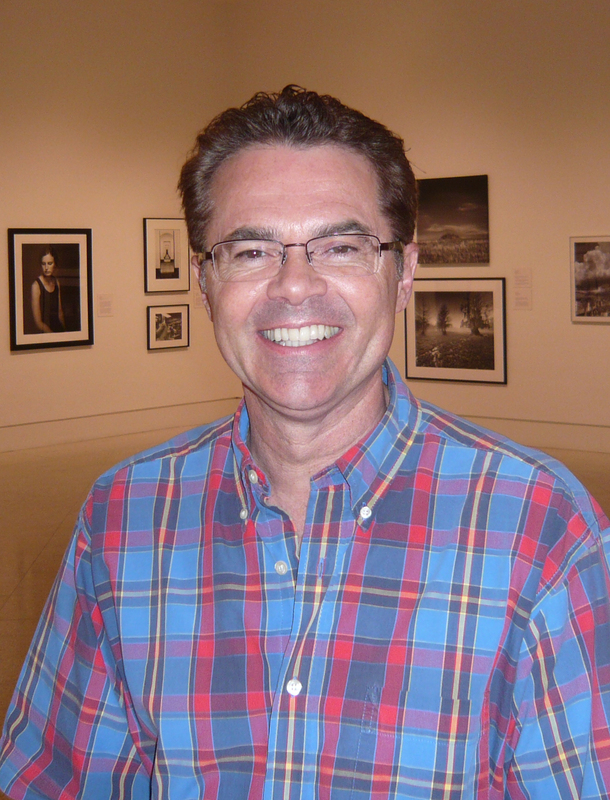 Curator Jack O’Brien was selected by the United Arts Council of Collier County as one of the 2013 Stars in the Arts. According to the Naples Daily News, the United Arts Council introduced the Stars in the Arts program eight years ago to recognize leadership in the arts. Each candidate is nominated by a member of the public and a selection committee of past Stars in the Arts and community leaders reviews them. Jack was among 48 nominations received this year. Jack O’Brien oversees exhibitions at The von Liebig Art Center and the Association’s collection of nearly 200 works in all media by artists who have lived in or had a connection to Florida. In addition, he has been active on the local and State levels judging art competitions, serving as chairperson for the City of Naples Public Art Advisory Committee and acting as a grant panelist for the Florida Division of Cultural Affairs in Tallahassee. He earned a Master of Arts Degree in Arts Administration from the University of New Orleans, a Bachelor of Arts Degree in Fine Art from the University of South Florida in Tampa and an Associate of Arts Degree from Edison State College. Jack will join the fellow honorees in February at the Stars in the Arts award ceremony luncheon at the Naples Grande Resort on Thursday, Feb. 28. Information about the event is available by calling 239-263-8242 or visiting the United Arts Council’s website at CollierArts.com. The arts collide in a special evening of music and painting at The von Liebig Art Center. Artist Tammra Sigler paints live to the music of Ars Nova String Trio performing in concert. The evening includes wine and dessert, and a live auction for the artwork created that night, with guest auctioneer, Bill Barnett. Chapel Grill is offering a special dining deal for A-muse patrons only. Tammra Sigler, Yo-Yo Ma Unaccompanied Cello Suite No. 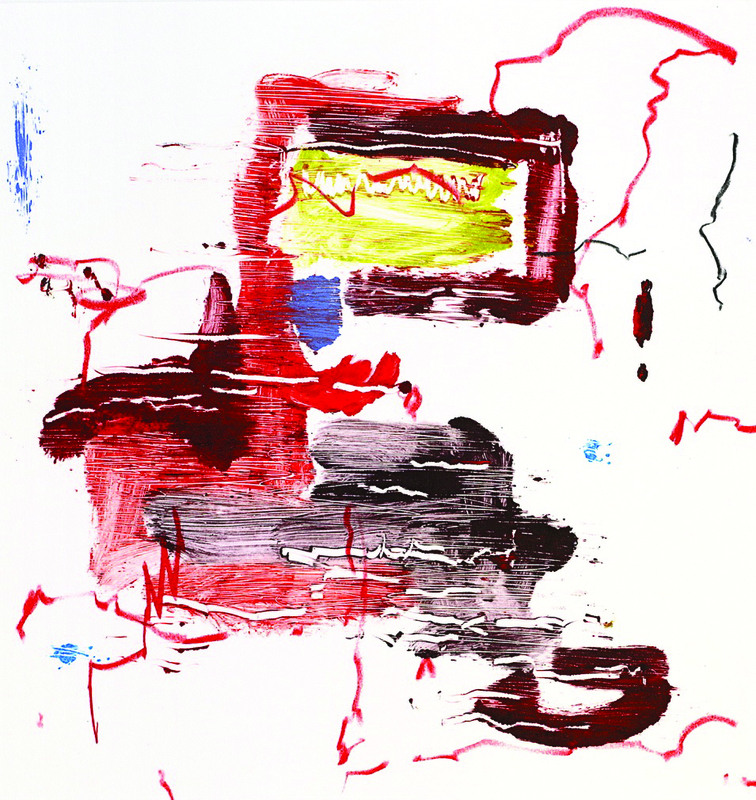 1 in G Major – Bach Gigue, monotype/drawing, 2010. 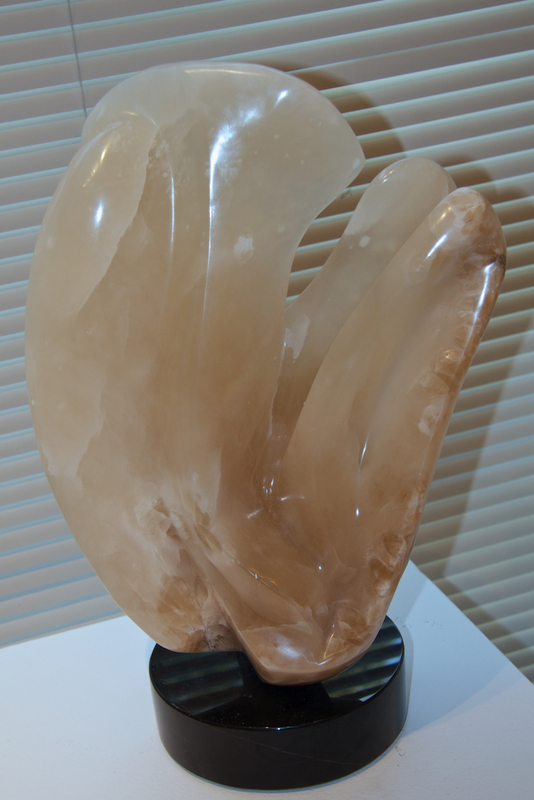 Tammra Sigler‘s work has been shown extensively and she has been awarded many prizes in the Baltimore/Washington area as well as Boston, Philadelphia, New York, Cincinnati, Los Angeles, Lexington, Palm Beach, Naples, and throughout South America. Sigler’s studio is in Naples, and she continues to paint, print, teach, and mentor in both Naples and Baltimore. Often her classes at The von Liebig Art Center include live music and performing artists to inspire and enliven the creative spirit. She credits master artists Matisse and Picasso with opening the door for her to try anything. Members of the Ars Nova String Trio bring chamber music to a new generation and inspire future musicians – not to mention expressive artwork! The Ars Nova String Trio is establishing itself as an important presence in the chamber music world as vivid interpreters of classic repertoire, advocates for new music, and dedicated teachers and mentors to a generation of young musicians. 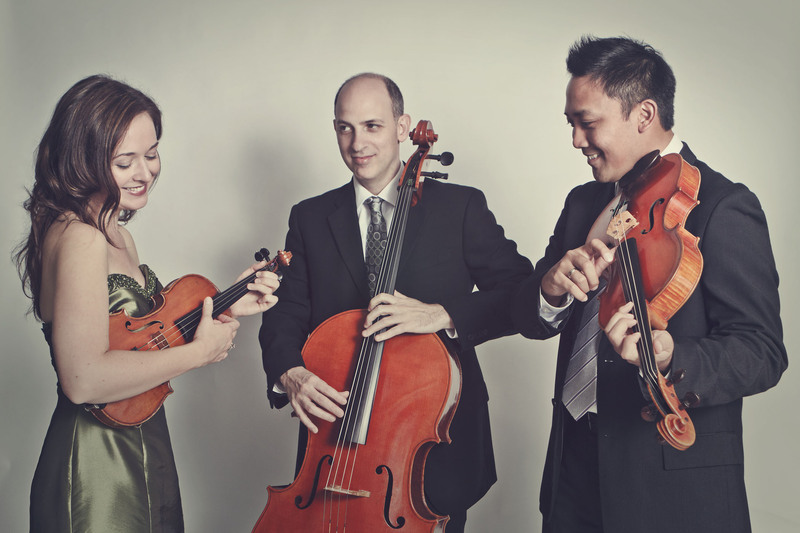 Based in Naples, the Ars Nova String Trio brings together three chamber musicians from very diverse backgrounds. Jennifer Kozbial, violin; John T. Posadas, viola; and Adam Satinsky, Cello met while performing together as leading members of the Naples Philharmonic Orchestra. Naples Art Association proudly includes this special artistic happening as part of ART Connects, a lecture series that explores the power of creativity and includes workshops for artists about the business side of their career. ART Connects, features 12 events and may be purchased as a series with tickets available for $40 for members and $60 for nonmembers. Limited individual tickets to A-Muse are available for $20 for members or $25 for nonmembers. Jan. 25, 2013, 7:30 p.m.
Part of the ART Connects series. Please call 239-262-6517, ext. 100 to purchase tickets and reserve your seats. 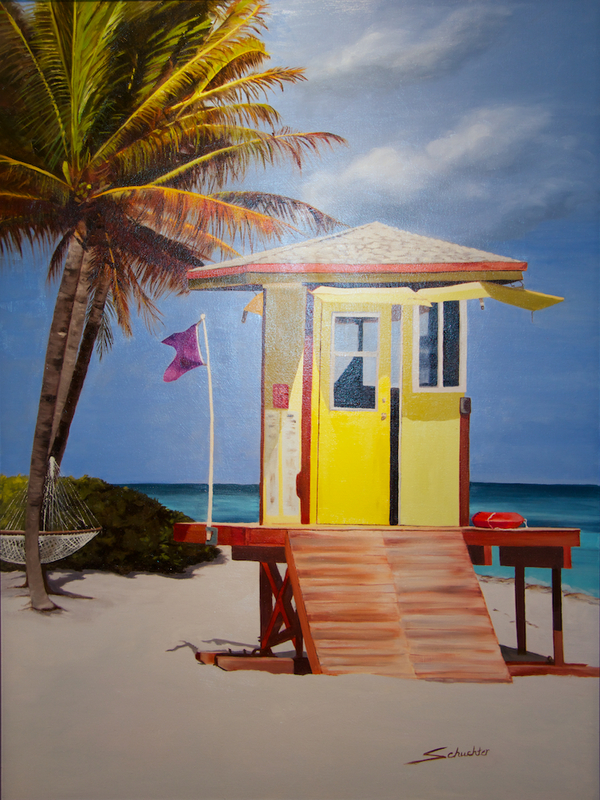 Proceeds benefit the Naples Art Association, a 501(c)3 nonprofit organization. Gallery owner and author Paul Dorrell is driven to help undiscovered artists get the recognition he feels they deserve. As a gallery owner and art consultant, Paul Dorrell specializes in helping emerging artists break out into professional status. 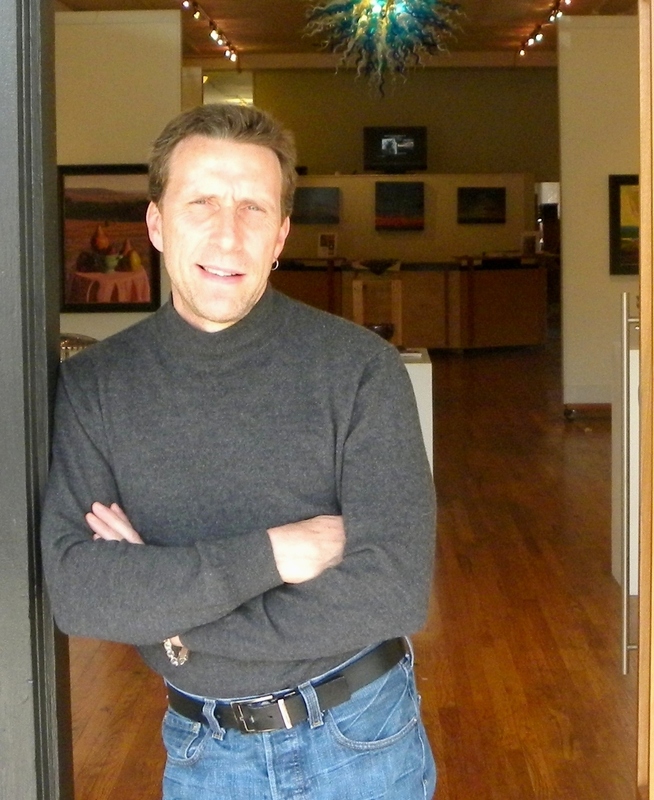 Dorrell founded Leopold Gallery in 1991. His clients include Warner Brothers, the Kansas City Chiefs, H&R Block, the Mayo Clinic, and over 1000 private collectors. Paul has written for numerous art magazines and spoken at venues such as the Rhode Island School of Design and the Art Students League of New York. He is also dedicated to mentoring teenage artists from urban areas. 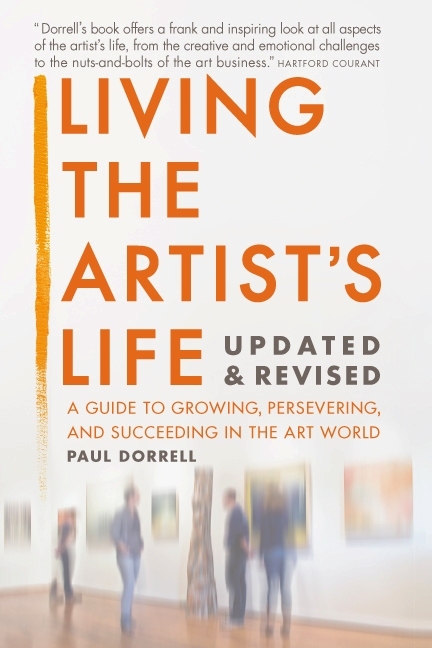 Naples Art Association proudly includes Paul Dorrell’s lecture and book signing as part of ART Connects, a lecture series that explores the power of creativity and includes workshops for artists about the business side of their career. ART Connects, features 12 events and may be purchased as a series with tickets available for $40 for members and $60 for nonmembers. Individual tickets to Paul Dorrell’s Living the Artist’s Life are available for $10 for members or $15 for nonmembers. Jan. 14, 2013, 5:30 p.m.
Art is everywhere. It’s a historian, a reporter, a therapist, an interpreter, an entertainer, a designer. From lessons about culture before our time to seeing today’s world from other perspectives; from creative ideas and inspiration that move us, to expressing our own personality and feelings: The artistic spirit helps us connect. ART Connects explores how. Naples Art Association announces ART Connects, a lecture series that explores the power of creativity and includes workshops for artists about the business side of their career. All lectures take place at 5:30 p.m. (unless otherwise noted) at The von Liebig Art Center, beginning on Jan. 14, 2013. The first five lectures take on different topics and themes on the many ways artistic inspiration transpires. Audiences will hear from artists about their experiences and processes, discover the science behind rescuing precious works of art affected by natural disasters, and gain a deeper appreciation for the Latin American influence on the art and history of Florida. A special series of workshops delve into the business of being an artist. Three well-respected speakers have tips on getting your artwork seen and protecting your creative legal interests. Watch our blog in the next several weeks to learn more about each individual lecture! The arts collide in a special evening of music and painting. Artist Tammra Sigler paints live to the music of Ars Nova String Trio performing in concert. The evening includes wine and dessert, and a live auction for the artwork created that night, with guest auctioneer Bill Barnett. Chapel Grill is offering a special dining deal for A-muse patrons only. Fixing, repairing and mending our treasured objects have a long tradition on the preservation of our cultural patrimony. Viviana Dominguez will take you around the globe, from Spain to Hawaii, to the fascinating world of rescuing art affected by wars, earthquakes and hurricanes. Nicario Jimenez creates retablos, folk art portable boxes filled with brightly colored figurines arranged into intricate narrative scenes. From the 16th to the 19th centuries, retablos were carried through the mountains by Spanish priests as portable religious shrines for Catholic saints. Later, they were adapted by indigenous people to include their own deities and mythologies. Nicario’s compositions depict religious, historical and everyday events. May 2, 5:30 p.m., Latin American Influence on the Art & History of Florida, no cost. Blending traditional, international & personal tales, bilingual storyteller Carrie Sue Ayvar takes her listeners on a journey into the imagination connecting people, languages and cultures through her stories that flow effortlessly between Spanish and English. This program is supported by the Florida Humanities Council with funding from the Florida Department of State, Division of Cultural Affairs. ART Connects may be purchased as a series with tickets available for $40 for members and $60 for nonmembers, or individually (prices noted next to each one as described in this article). The business of being an artist workshops are presented as a free service to artists in the community. Please call 239-262-6517, ext. 100 to purchase tickets and/or to reserve your seat. 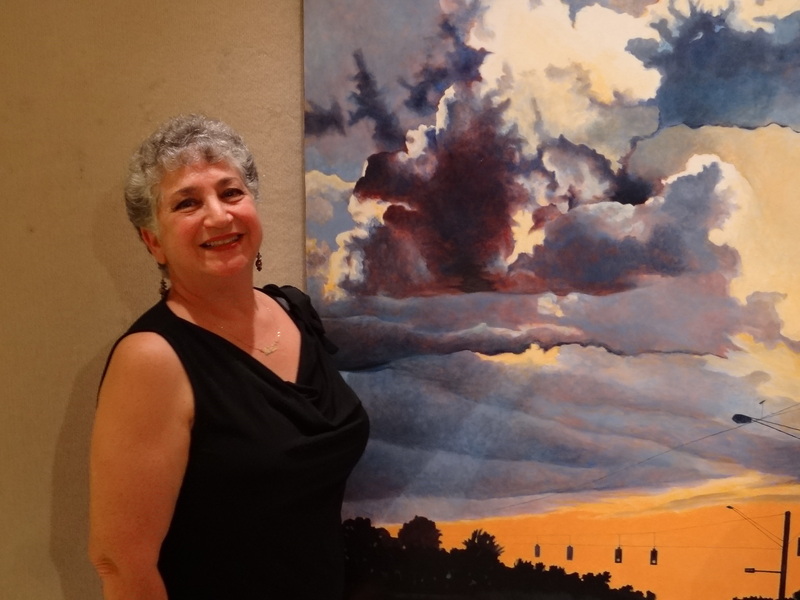 Fort Myers Artist Celeste Borah wins Best of Show for her large scale acrylic on canvas painting, Lee Road Sky. 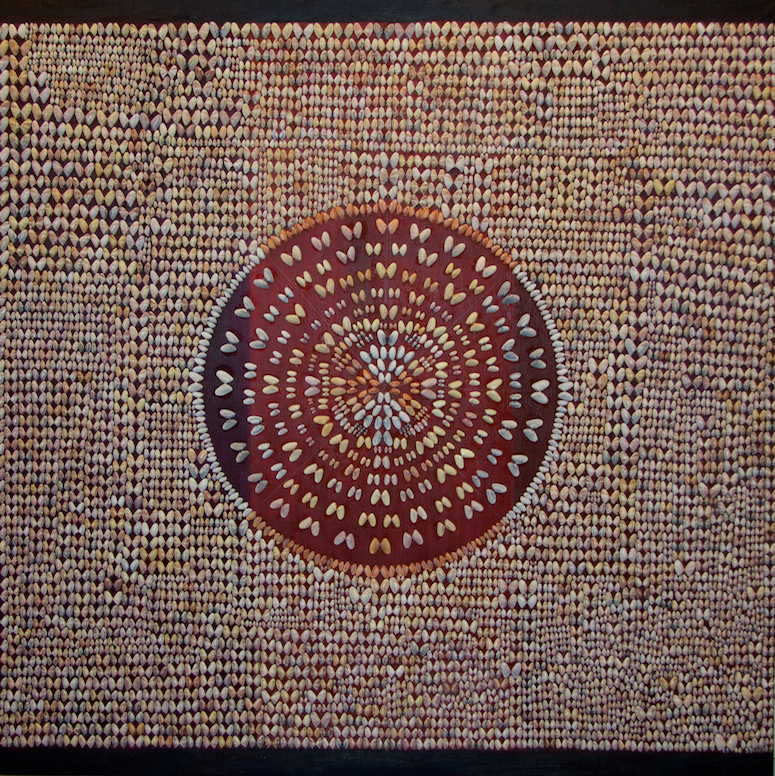 The National Art Encounter 2012-2013 and the Members’ Gallery All-Media Exhibitions at The von Liebig Art Center both feature a wide variety of mediums including acrylic, oils, watercolor, drawing, printmaking, photography, fibers, metals and found objects. National Art Encounter 2012-13 is the result of a highly competitive jury process open to artists throughout the United States. In May of 2012, a call-for-artists was issued inviting interested artists to upload digital images of their artwork together with an artist’s statement for judging. More than 800 works of art were submitted by more than 400 artists. Exhibition jurors Margaret A. Miller, Corrina Peipon and Dulce Román reviewed all entries and nominated artists for the six cash awards totaling $2,500. Celeste Borah of Fort Myers won Best of Show for her large scale acrylic on canvas painting, Lee Road Sky. Below are the winning artists with links to images of their winning artwork. their work in a professional environment and for visitors to see the quality and diversity of what is being produced,” she added. these artists are compelled to share their visions with us, and that requires a great deal of courage,” she noted. Dulce Román is Curatorial Chair and Curator of Modern Art for the Samuel P. Harn Museum of Art at the University of Florida in Gainesville. Of the variety of works represented, Roman was attentive to how each artist showed exemplary mastery of their chosen medium. “I particularly enjoyed works that played with scale, presented challenging viewing distances, or involved a degree of experimentation in terms of materials or technique,” Roman said. The Members’ Gallery All-Media exhibition, on view at the same time, features fresh, new artwork in the Cuthbert Studio on the first floor of The von Liebig Art Center. Members’ Gallery jurors were impressed. “The exhibition reflects an engaging variety of media and the artists demonstrate innovation and a high level of mastery of their media,” they said in their official statement. Below are the three artists selected for top awards. The next Members’ Gallery exhibition will be accepting entries for Scene in Naples on Jan. 28 from 10 a.m. to 4 p.m. Both National Art Encounter 2012-13 and All-Media exhibitions will be on view through Jan. 26. Naples Art Association thanks its generous sponsors Physicians Regional Healthcare System, The Naples Daily News, Lite 93.7 FM and Happenings Art & Entertainment Magazine. Artwork shipping and receiving is provided by ARTMove LLC. The December 7th exhibition preview reception was generously sponsored by Alexander’s Restaurant, Fine American & European Cuisine. Hedi Moran’s blended style of realism and impressionism gives even still life scenes a sense of vibrance and liveliness. Her florals glisten with sunlit freshness and spontaneity. Artwork by Hedi Moran, Peonies in a Black Vase, dances with light and color. Born Åse Pedersen in a Norwegian coastal village, Hedi Moran immigrated to the United States as a child. She began painting in 1973, studying at the Art League of Los Angeles and later at Scottsdale Artists School. She is a member of Oil Painters of America, past president of Scottsdale Artists League, and a long-time instructor in still life oil painting at Scottsdale Artists’ School. An award-winning artist, her paintings have appeared in numerous art exhibits throughout the U.S.A., including several juried shows sponsored by Oil Painters of America and Salon International. She is a three-time finalist in the “Flowers & Garden Competition” sponsored by International Artist Magazine. One of her paintings, “Antique Roses,” was exhibited at the residence of the United States Ambassador to the United Nations in Geneva, Switzerland. Hedi also conducts oil painting workshops throughout the United States, in Canada, France, and Norway (where her classes are taught in Norwegian). Students rave about the experience and opportunity they gain from working with her. Her paintings have filled the pages of numerous magazines over her career, and she shares her techniques on several DVDs. Easels at a Hedi Moran workshops are coveted and fill quickly! Hedi teaches a workshop at The von Liebig Art Center, “Play of Light on Florals,” for intermediate and advanced oil painting students on Feb. 12-16 from 9 a.m.- 4 p.m. Her instruction focuses on painting vivid, impressionistic florals in oil with emphasis on the use of light, shadow and color. Below is a list of even more great opportunities in Session Three of classes and workshops with Naples Art Association. Upcoming daytime workshops run Jan. 2-5, 2013 and Feb.11-16, 2013, with some evening workshop sessions of Wine and Dezine. Session Three weekly class opportunities run on different days, either morning or afternoon sessions, Jan. 7, 2013 – Feb. 9, 2013.